Parents in measles-hit Ukraine are getting fake vaccination certificates to avoid getting their children immunised, it has been claimed. The country has one of the world’s biggest outbreaks of the disease and is a key driver of the problem in Europe. The World Health Organisation says 95% of the population should be immunised to protect against an outbreak. But it ranked Ukraine in a global top ten of countries with the highest number of unvaccinated children. Dr Fedir Lapiy, a pediatric immunologist from Kiev, told Euronews that fears and mistrust in doctors meant parents in Ukraine were finding ways of doing through routine immunisation. "We all know that there is a huge number of fake vaccinated children,” he said. “Every mum at the playground knows it. They say ‘All the mothers do it, they just go and bribe the doctor or a nurse’. "Then the question arises: what predictions on vaccination can we make in such a situation?" asked Dr Lapiy. Nevertheless, studies show the majority of Ukrainian parents support vaccinations, which gives hope to the fight against measles. Support of vaccinations among parents remains at 74.5%, while negative attitudes decreased from 12.7% in 2017 to 9.6% in 2018, according to the National Health Index survey released at the end of last year. Natalia, a 28-year-old mother from Kiev is one of those who oppose vaccines. She says her husband and parents support her decision not to get her four-year-old daughter immunised. "When I was pregnant I started reading information online about maternity and learned that vaccines can cause autism and many other diseases," claimed Natalia. "Vaccination does more harm to a child than good. Not all the information online can be trusted, and maybe some of that is a lie, but my husband and I decided not to risk the life of our daughter. The claim of a link between the MMR jab and autism originally came in a 1998 study by Andrew Wakefield in The Lancet, but amid widespread criticism, the magazine retracted the article 12 years later. Vaccination is not a recent problem in Ukraine. A year ago, the World Health Organisation (WHO) published a list of 10 countries with the highest number of unvaccinated children. Ukraine ranked ninth in the list between Angola and Ethiopia. According to Deputy Minister of Health, Olga Stefanyshina, there have been problems with vaccines supply in the past. “Back in 2010 we had a critical shortage of vaccines,” said Stefanyshina. “But the situation got better and at the moment we have enough vaccines available in all regions of Ukraine." 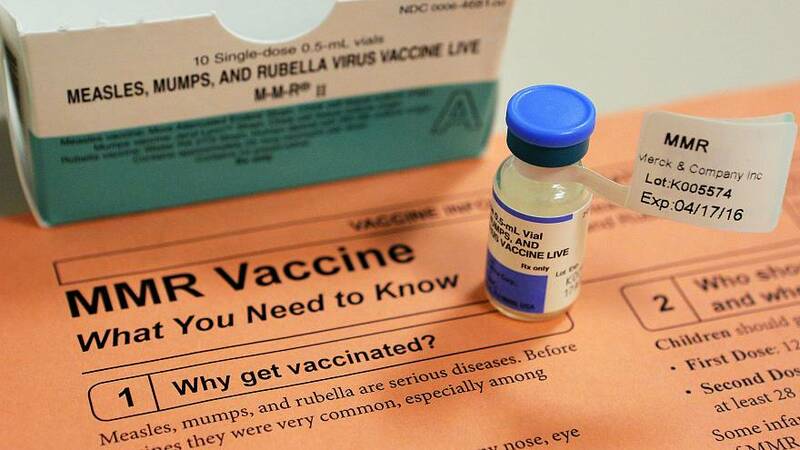 As of March 7, Ukraine had 1,173,915 doses of MMR (measles-mumps-rubella) vaccines produced in Belgium and the USA which, according to the officials, is enough to cover the country's needs. The number of children who get routine immunisation on time is also growing. "In 2016, less than 50% of children were vaccinated against measles in line with the vaccination calendar," said Kateryna Bulavinova, UNICEF’s Ukraine Health Specialist. "In 2017, 93.3% of one-year-old children and 90.7% of six-year-old children received a vaccine in line with the calendar. “Yet, vaccination of children who missed routine immunisation in previous years is ongoing." UNICEF issued a report in March warning that the number of cases of measles registered has leapt to alarmingly high levels and listed ten countries where the disease is spreading the most. Ukraine, which recorded 54,000 cases in 2018 and 16 deaths, topped the list. The country has seen more measles cases reported since the beginning of 2019 than during the whole first half of last year, the Ministry of Health of Ukraine reported earlier this month. In just three months, 35,000 measles cases were registered in Ukraine and 14 people died, according to the ministry. After several weeks of decline, the number of measles cases has begun growing again, official data shows. Being a highly contagious disease that spreads through the air, measles primarily affects children and can lead to serious complications and even death. "All children should receive both the first and the second dose routine immunisation on time," warn the representatives of the Ministry of Health, who call on parents to vaccinate their children as soon as possible. On April 2, Ulana Suprun, an Acting Minister of Healthcare in Ukraine, had a meeting with the representatives of Khmelnytsky Regional State Administration in the west of the country discussing measures to fight the spread of measles. "We decided to introduce emergency measures to increase the level of measles vaccination," wrote Suprun on her Facebook page after the visit. "In fact, this is the continuation of the operation, which started in Lviv region on the Polish border, where the number of the measles cases was the highest just two months ago. The same measures were initiated by local authorities in the Vinnytsia region. More than 12,000 schoolchildren were vaccinated there in February. "A special vaccination operation will start in Khmelnytsky region shortly," promised Suprun. Why are so many Italians against vaccines?